As I walked to get a coffee the other day I passed a sandwich board for a bar by the shop. I was really pleased that they have finally stopped spelling "tacos" with an apostrophe. When I walked back to the shop with my drink I saw the reverse side of the board. I'm sure they were thinking, "An N goes in there somewhere." I'm not sure which is better: tacos with an apostrophe or Wendesday. 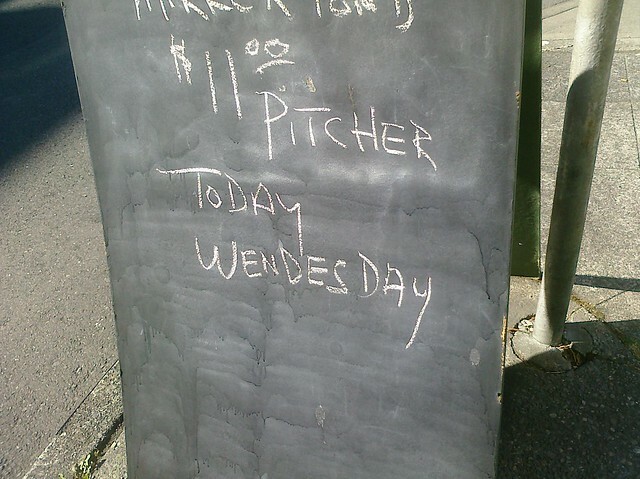 At least "Wendesday" approximates the actual pronunciation more closely than the correct spelling does. Maybe they were thinking, "isn't there an extra D in there somewhere?" Adding an apostrophe to plural words is a real pet peeve of mine, so I'm glad you posted about that. Okay, as a dyslexic reader, it took me a minute to figure this out. However, there is no excuse for taco's. Unless his name is actually Taco. Which would be cool. Oh, please! Don't get me started! I go nuts over apostrophe placement. I, I, I... if I say much more than that, I will lose my mind. Did you ever read the book Eats, Shoots & Leaves by Lynne Truss? It's all about stuff like that. Hey, my local Mexican eatery spells Wendesday wrong too! Hahaha!! !